Wellpath Energy is a technical leader in the horizontal / directional drilling industry utilizing partners that are producing advanced tools. These partnerships include the newest generation of MWD/LWD tools, motors and proprietary well planning and drilling software, Accuwell by Wellpath. Wellpath’s advanced tools and other directional drilling equipment and software can offer greater functionality, information for decision making and better reliability than the older technology being used by much of the industry. We start with assisting our customers with engineering and well planning services, then monitor every section of every well as it is being drilled. This permits us to make recommendations on any required bit, motor or other strategy changes collaborating with our customers. Our directional drilling engineers have drilled all over North America. We have learned from every well in every field and formation and constantly offer our customers consultation and advice from our experiences. Because of our experience drilling in many locations and geology, our customers can seek our advice. By utilizing new technology, we regularly drill faster wells for our customers thereby lowering their overall costs. 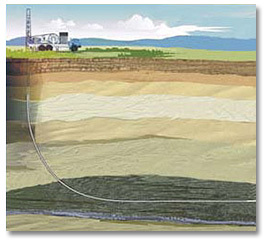 Our drilling experience and types of directional wells is quite varied, ranging from short radius build up sections ,medium radius build up sections, long radius build sections, extended reach wells, build and hold wells, sidetrack wells, re-entry wells and/or “S” curve wells, and long lateral runs with various rotary steerable applications. Wellpath will manage your Horizontal/Directional drilling needs on a turnkey basis as well as provide our experienced MWD/LWD and drilling engineers. While drilling, our field team will provide timely drilling information both in the field and to management as well as up to date real time logging information for your geology team . Today, most of our customers utilize Gamma to obtain an underground vision of the formation being encounter while drilling. By measuring gamma counts and plotting them over depth, you can identify distinctive barriers or formation layers underground. Looking at the formation’s cross sections allows the team to make any necessary adjustments to the well path and drill with more precision to hit the target. In traditional drilling practices, samples take time to travel to the surface. The reality is, by the time particles reach the surface and get analyzed, you could be in another formation, or something else might have changed. In the alternative, using Gamma gives quick access to the information needed to make important decisions.